The Institute of Certified Customer Advocacy Professionals (ICCAP) will be holding three examination sessions immediately prior to the upcoming Summit on Customer Engagement event in Burlingame, CA. For those of you not familiar with ICCAP, it is a coalition of industry experts and practitioners who are committed to promoting excellence and accountability in the customer advocacy industry. The mission is to institutionalize industry standards and empower customer advocacy professionals. Customer Advocacy Professional I – demonstrating an understanding of the fundamentals of customer advocacy. Customer Advocacy Professional II* – having at least two years of experience (or equivalent) and demonstrating knowledge of either being charge of a sub-team on an advocacy program or having more direct accountability for delivery/SLAs. Customer Advocacy Professional III* – having at least five years of experience (or equivalent) and demonstrating knowledge of being able to start an advocacy program from scratch and/or having total ownership for a well-rounded one. *= For these levels of certification, in addition to passing the examination you will be asked to provide details of your experience and 2 reference contacts that can vouch for your expertise. To learn more and register, note that space is limited, please visit the ICCAP site The event special pricing for March 13 is $249 per exam; almost half-price! Time to refresh your program? This blog post from Influitive has hints for spring cleaning your AdvocateHub. All great hints and ones we do more frequently than only with a spring refresh. If you are an active member of our hub you have probably noticed that we update regularly. Each quarter we change the theme of our Hub. We brainstorm potential new ‘locations’ and have a Hub challenge where participants can vote for our next destination. And then the refresh begins. Our Hub manager, a position which rotates so we all have expertise with AdvocateHubs, chooses a specific day for the change. Over a pizza lunch we make quick work of a full refresh. All challenges are reviewed to ensure they are still relevant and we check for broken links. Photos that accompany each challenge are reviewed and the majority are changed to align with our new theme. Our latest change was In January when we moved from Germany to the Olympics and Korea. The changes to challenges and the visual theme are the most visible though behind the scenes we’re also looking at advocate groups, rewards, and our metrics. While the Inflitive article is specific to AdvocateHub refreshes, it really applies to all types of advocate programs. How do you keep your program fresh and relevant? The Best Advocate Marketing Awards (BAMMIES for short) are produced by Influitive and designed to showcase the great strides that are being made by B2B marketing leaders who are working with their advocates to drive brand, demand and revenue. The BAMMIES are awarded annually. The 10 categories include “Building Event Buzz with an Advocate Swarm”, “The Advocate Marketing Hall of Fame”, and the big one – “The Advocate Marketing Program of the Year”. You can vote for the winner of the latter category, which is awarded to the program you think has delivered measurable value through inspiring and flawless execution. Vote here. Here are the 2017 Advocate Marketing Program of the Year finalists, congratulations to all! Hurry, voting ends Friday, November 24 at 5 pm EST. Winners will be recognized at the Best Advocate Marketing Awards ceremony at Advocamp on December 6th-8th, 2017, in San Francisco. Congratulations to our Award Winning Client! Congratulations to our client Lisa Matzdorff, director of customer experience at Symantec. She was just named the winner of the Sherpa Award for Innovative Feature Use at the Elevate Customer Summit hosted by RO Innovation. Lisa uses ReferenceView, an application from RO Innovation, to track recruitment and reference activities. She needed a granular method for tracking and reporting each stage of recruitment to support the volume and multi-step process in place at Symantec. Lisa turned to ReferenceView’s workflow functionality to keep recruitment of new advocates moving at an optimal pace. Notes are captured within each step so that a permanent record remains available. This approach ensures the recruitment process is as efficient as possible, with a clear view of metrics. The process has enabled Lisa to consistently exceed the security industry’s standard advocate recruitment rate! Congratulations Lisa on both your award and your great results! (We just returned from the Cyber Defense Summit 2017 in Las Vegas. Leading up to the Summit we worked with customers to create videos and quotes that were used throughout the event. Our trip to Australia to film customers resulted in such great content we expedited processes and went from filming in one country to showing our videos on the main stage of the event 12 days later! 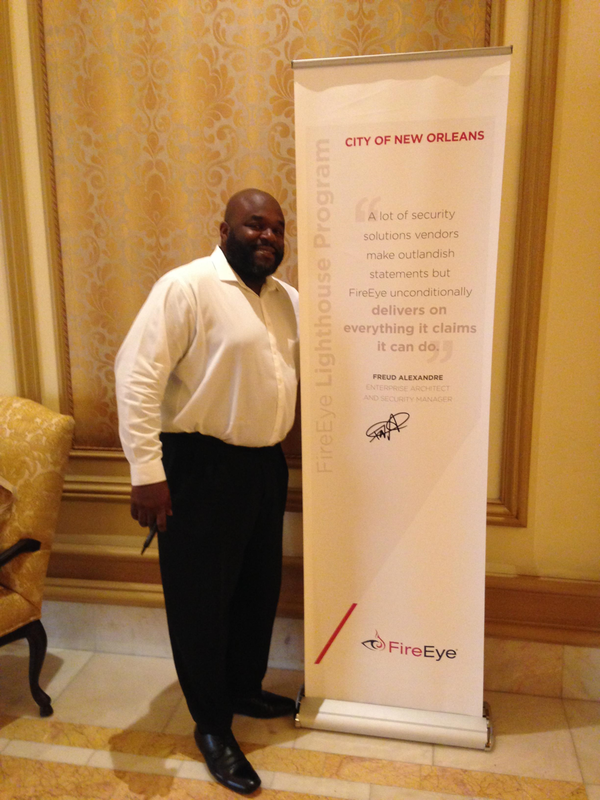 Love this photo, Freud Alexandre, the Enterprise Architect and Security Manager for the City of New Orleans (and one of our favorite people! ), was so happy to be featured he autographed his banner. That is the signature of approval! What we like to see with all our customer deliverables. We work closely with RO Innovation and their solution is used by several of our clients. Congratulations are in order as they were recently named the top Advocacy and Social Selling tool for 2016 by Smart Selling Tools. It’s the third year in a row they’ve been chosen as a top marketing tool. See more here Smart Selling Tools is an analyst firm specializing in sales productivity and sales performance improvement. The companies they chose for the 2016 awards all have innovative products which produce measurable outcomes. Congratulations again to RO Innovation! We recently worked with a client to launch an Influitive AdvocateHub as a new front-end to their existing advocacy program. The decision to do this was made swiftly with the requirement that it went live 3 business days ahead of their inaugural user conference. Being able to unveil a hub at a major customer event is the perfect opportunity to accelerate engagement and build excitement for an advocacy program, however in this case it gave us only 14 business days to design, configure and populate it with activities/challenges! We are not ones to be overcome by what seemed impossible odds. What most hubs take 6 to 8 weeks to deploy, we accomplished in 2.5! For those of you not familiar, an Influitive AdvocateHub enables the construction of a wider advocate community by inviting customers, partners, prospects and employees into it to complete "challenges" that span fun activities, educational opportunities and taking action such as making referrals, taking reference calls, writing product reviews and more. As advocates complete challenges, they earn points, badges and progress through levels that can be used for a variety of perks and privileges. For our client, the hub out-stripped all expectations and success metrics that were defined in the planning stage: Nearly 60% of all attendees at the event joined and immediately started engaging in challenges. It exceeded the initial expectations for the number of participants 8 fold! Hub members completed over 1000 challenges in less than a week; nearly half became new social media followers of our client, and tweeting and forwarding of blog posts reached the highest levels our client had seen. Participants gave glowing reviews and volunteered for a variety of advocacy activities from case studies to presenting in webinars and at future events. Customer references vs. advocates. Quite a topic of conversation. There are all sorts of articles about the differences between advocates and references. Simplistically customer reference programs have been a critical part of the sales process. Customers are recruited, requests are fulfilled, and sales increase. Usually ­­­customer reference activities are reactive. References are asked to participate in activities such as a call with a prospect or speaking at an event. Advocates, on the other hand, are proactive in their promotion (and defense) of your brand. An advocate will proactively engage in a community or at an event, amplify your message in social media, or help with new product input. And they will also take that important call with a prospect! Here is an interesting article on how BMC made the transition from relying on references to a strong advocacy program. A valuable read. We have many clients and each has a slightly different advocacy program. Over time, added experience and viewpoints has increased our knowledge and capabilities. Together, those led to our decision to do a complete process review. It’s good to take a step back now and then to ensure we’re using the best processes and tools across the board. It’s also a chance to do some cross training. Team members who work on accounts where our services are very focused might not have yet had the opportunity to participate in the full range of our offerings. The first step was to update our master template. This will give us a refreshed starting point for new clients and updated documentation for training new hires. This process review is an opportunity to look for growth for our clients. We can share best practices and genericized information about where other clients are seeing the most impact. And we know there’s no better salesperson than a happy customer! As we help our clients harness the power of their happy customers it leads to increased sales. And that’s really what we’re here to do, help our clients grow. Check what you already have first! We’re helping a new client get a more formalized customer advocacy program off and running. We’re contacting customers that have given high NPS scores recently, that have been part of early adopter or beta testing programs, or that were ‘known’ to product marketing. But there are other treasure troves of advocates out there! Stories on our client's web site and quotes in press releases are just two examples of advocacy in action. In the zeal to get new advocates you need to be careful to not overlook the ones you already have! Make sure they are welcomed into any new program. It’s a great opportunity to reconnect and understand the activities they are now interested in. They have been there for you in the past, make sure they are a central part of your program moving forward. We were recently asked to do a special project for a new client. They had a high priority need for customer references for a specific product. A rather new product at that. And, of course, a very short deadline. Major events were on the schedule where they needed speakers and new collateral because who better to tell your story than a happy customer? Sometimes you need to call in reinforcements, which they did. They didn’t have the bandwidth to take on this special project so called us. We have the processes in place already, and the people. We were able to supplement their staff and contact every single sales rep that had sold this product, discussed their customers, and then went on to talk with each customer who was a potential reference. We were able to help frame the stories to highlight business benefits, not just the ‘speeds and feeds’. Putting extra resources on this, in a very short window, was really successful. We’ve uncovered several new references already and we're not yet done. While typically we run major programs for our clients sometimes we’re asked to do special projects such as this. It can be a huge help to have extra bandwidth when you need it – big or small we can help with your customer reference challenges! Another successful conference! We were one of the sponsors for the Summit on Customer Engagement which was held earlier this week. It’s always a great opportunity to meet people, learn about new programs, plus share best practices. It’s a very collaborative environment, with everyone willing to share ideas. There was plenty of time in the agenda for deeper discussions and many left with a long list of actions they can immediately implement to improve their programs. We look forward to seeing many of our clients at the summit each year. In our dispersed and virtual world a face to face meeting is a pleasure. One of our clients stayed additional days and used our offices for meetings, instead of coffee shops. Our conference rooms sure came in handy! If you're in the Bay Area and need a place to work or meet people keep our offices in mind! We’re again sponsoring the Summit on Customer Engagement. The event is back at the Sofitel Hotel in Redwood City, California. We’ll see you February 25-26, 2014! The event is for everyone active in customer reference and advocacy. If you’re new to the field you’ll have access to experts through formal presentations and informal discussion sessions. Even the experts will learn something new. The workshops often provide tools and forms that you can put to use right away. The summit also provides perspectives from experts in related fields such as social media, advisory boards and councils, demand generation, and other topics customer reference program managers need to be informed about. It’s a great opportunity to meet others in the field and share ideas. We’ve had many 2014 planning discussions with our clients recently. It's exciting to see our clients expanding and there's lots of growth ahead for us too. The discussions remind me that 2013 has been quite a year for Referential, Inc. We moved into new offices early in the year. Being right across the street from Ebay not only makes us easy to find but some pretty good food trucks are nearby daily! We hired several new people, more on the horizon. Yes, training takes time but it’s been great seeing our company culture evolve. In 2013 we also added important skills, such as support for more languages and expertise in additional industries. Our business and technical knowledge means we can see the value our clients bring to their customers and we highlight that value in all deliverables. Finally we also added new services. We’re often called upon to automate tasks, technical skills to the rescue! This year we’ve also advised many clients on data issues Spreadsheet or database and if the latter which one! A conversation we’ve had often. Whether our clients outsource the entirety of their customer reference program to us, having us do everything from initial program design through to fulfillment, or we do a smaller project such as a case study, all clients get nothing but the best from us. Give us a call, let's see how we can help you get even more impact from your customer references. Case studies - your customers tell your story best! The success of your existing customers is a powerful way to tell your story to potential customers. Case studies leverage your past successes and validate the effectiveness of your products and services through an objective voice, in a way your other marketing pieces cannot. Even B2B executives looking at the most complex solutions are influenced by the opinion of their trusted peers. Case studies give a voice to your customers to enable this positive influencing to occur naturally. Here at Referential, Inc. we’ve seen a recent surge in demand for case studies from our clients. We are able to leverage both engineering and business expertise to fully understand the business value our clients’ products and services deliver. We know the right questions to ask to uncover quantifiable benefits and create compelling stories to help accelerate purchase decisions by your prospects. Need a case study? Give us a call! Case Studies - A Record! Case studies, success stories, or whatever your favorite term, are common components of customer reference programs. We write a lot of them. Some of our clients have unique style guides, otherwise our writing follows AP rules. Believe it or not we had a discussion about comma placement at lunch. Do you put a comma before ‘but’ in a sentence? We were divided on that one. This week is a record for us. The largest number of case studies approved for publication ever. And we’re only at Thursday! They’re not easy to write. You need to tell an engaging story where the customer gets to shine, while at the same time our client’s key value add is the focus. Review cycles are always interesting too as they include not only our client but their customer too. From the beginning of the process to case study publication can be as short as 2 weeks, though some take much longer. Our depth of understanding of our client’s offerings is key. We know the business value they bring so we’re able to ask their customers the right questions to get powerful quotes and strong supporting proof points. And we have great writers! It will be interesting to see how long this record stands! Displaying Customer Logos - Get Permission! It’s great to have customer logos in your new brochure or to have their logos sprinkled throughout your website. But don’t do it without permission!! Logos are typically protected by copyright and trademark law, let alone by what are often very complex rules of use. Bottom line – it’s actually illegal to use another company’s logo without their consent. Even if you’re selling or promoting their products you need consent. If you’re implying they are a happy customer of yours then you really need consent! Development of a brand can cost a great deal of time and money. Companies want to protect that investment. The little extra work of asking permission and using their company name and logo according to their guidelines can go a long way both professionally and legally. An ex-customer as a reference? Yup. That's what we had to find. One of the requirements of a recent RFP was to provide a reference that is no longer a customer. So a friendly ex. I thought our recent blog post was a good example of people asking the strangest things, but this even is stranger! Finding a match seemed impossible but was actually easier than we expected. First tip, never delete customer records from your reference listing. Whether you use a spreadsheet or a DB keep them all. You never know when even “not referenceable” accounts will come in handy. Next tip. Keep 'qualitative' notes about the status of your references. That's how we found our match. We reviewed the records for companies not currently referenceable and found one that was perfect. The notes from our outreach, plus additional information from the sales rep, told us they had done a pilot project, loved the product, but failed to get funding. They were just the friendly ex we needed. Not a customer, but with lots of good things to say to a prospect. Bottom line - keep your data, keep good notes, and expect the unexpected when dealing with customer references! “Let me get this straight, your customer wants to implement software using a methodology we don’t recommend? And they want a reference customer who will tell them it’s OK?” Yes, that’s what I heard the other day. For several of our customers we do the ‘matchmaking’ of sales rep or marketing request to the customer reference which best meets the need. Usually the request is for a customer in a similar industry, or using a particular product or product feature, maybe they want someone in a specific geographic area or a current customer the same size as a prospect. In this case the sales rep had a prospect who wanted to talk to a current customer who had implemented in a way that’s specifically not recommended! In the end we helped the sales rep realize this wasn’t a good idea, for many reasons. He went back to the customer so implementation would follow best practices. Not only do we do reference matching but sometimes we need to provide guidance on strategies to overcome issues and keep sales moving forward. But it really is true, people ask for the strangest things. Many brains are better than one! It’s happened to all of us. We have an ‘opportunity’ at work and we need some ideas, our mind is a blank or what we’ve tried in the past just isn’t bringing the results we need today. That’s something we’ve seen with a few of our clients. Maybe the challenge is finding new sources of customer references, maybe it’s how to get the most out of your user conference. The list can go on. Our clients have found many brains are better than one! We’ve done focused brainstorming sessions, including key members of our team as we all bring different experiences and expertise. The client brings the reference program lead and any important stakeholders. One client even brought their brand new summer intern, what a way to give them a quick education about customer reference programs! The sessions have been very successful, whether in person or over the phone. At the end of each our clients have an actionable list of new ideas. If you’re interested in a brainstorming session for your reference program contact us. We've found this always results in a steady stream of new ideas. What other approaches have you used?